One of the unique and most iconic features of many modern turtles is that they can withdraw their neck and head to hide and protect them within their shells. The group name of species which do this, Cryptodira, even means 'hidden-necked turtles' to reflect this unusual adaptation. Turtles and their ancestors have been around for more than 200 million years now, and are a remarkable evolutionary success story. 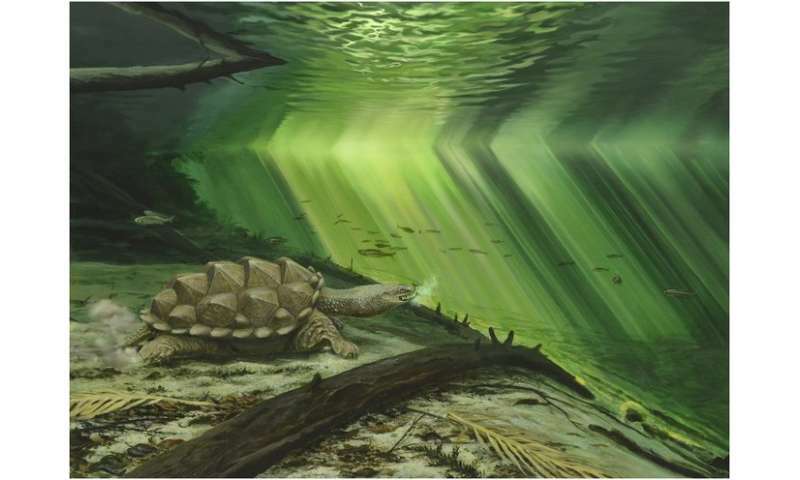 We know that by studying their fossils, the earliest turtle ancestors had rigid necks though, and were unable to retract them as modern species do. New research from Jérémy Anquetin and colleagues has provided insight now into the reason this bizarre act evolved in turtles, showing that actually it occurred twice in their long history. 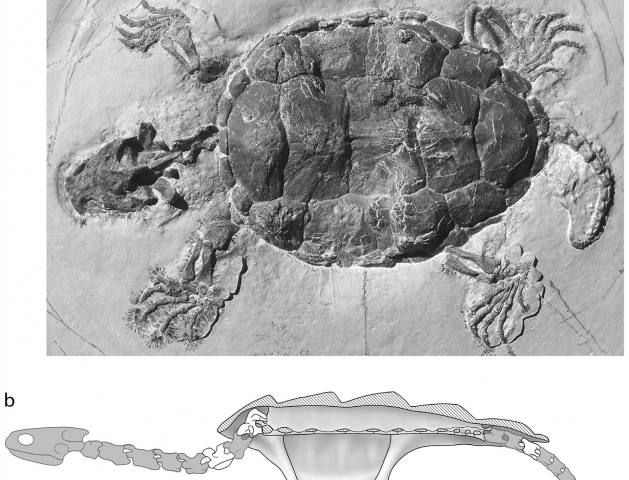 The team investigated a fossil turtle known as Platychelys from the Late Jurassic, around 150 million years ago, of Europe. Europe at this time was completely different to now – it was more like an island archipelago, with warm shallow seas inhabited by a range of unusual and now extinct turtle species. Intriguingly, the neck morphology of Platychelys was remarkably similar to its modern cryptodire relatives, indicating that it was at least partially capable of retracting its neck. It is able to do this by folding the neck muscles vertically, causing the neck to move inwards towards the torso, but apparently not quite enough to actually be of any use for protection. Although the muscles of Platychelys are not preserved, the researchers were able to infer this based on the broad shape of the neck, or cervical, vertebrae, and the wide spacing between the parts of the bones that the muscles attached to. Cryptodires also have a double articulation on their neck vertebrae, a feature worth pointing out here only because the condition has the awesome name of 'ginglymoidy'. As well as partially retracting its neck, it also seems that Platychelys was able to shoot it back out again. This is a method to ambush and capture its prey underwater, like some modern turtles are capable of doing, and especially useful to catch rapidly darting fish. This means that neck retraction for protection might even have evolved as a sort of additional, non-intentional function driven by the evolution of this mode of feeding in Platychelys. As we see this sort of behaviour in modern turtles that are distantly related to Platychelys and separated by around 150 million years, this is an example of what is known as 'convergent evolution'. This is where different species have similar adaptations to their environment or ecology that are acquired independently but for the same purposes. In this case, neck retraction seems to have evolved multiple times to make capturing prey even easier, and originally had absolutely nothing to do with protection, as is commonly thought. This adds an additional layer of complexity to our understanding of the early evolution of turtles, and the team will investigate this in more detail in the future by examining more fossils and trying to work out their feeding habits. The article finishes by saying "We hope that this study will inspire other to continue exploring the evolution of cervical vertebrae in early crown group turtles."